We are deeply saddened to share the news of Edgar's passing in February, 2017. His obituary is here. 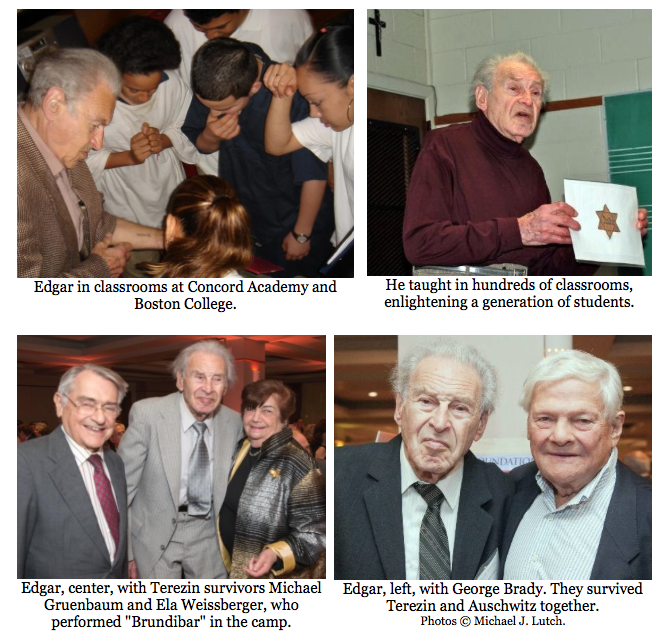 "Edgar was an exceptional educator not only of the Holocaust, but of leading a meaningful life. In the many Holocaust education programs we did together in the U.S. and in the Czech Republic, Edgar always inspired and challenged students with his unique and engaging blend of warmth, wit, and passionate dedication to remembering the Shoah. Edgar will continue to be a great inspiration to TMF's mission and programs. On a more personal note, I will miss cooking and 'making a Turkish' [coffee] with him. 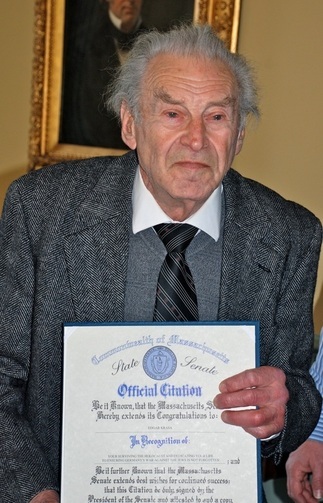 Edgar was and will continue to be my mentor and source of inspiration in my work with Terezín. He will be deeply missed. Edgar Krasa dedicated his life to educating young people about the Holocaust. He reached many thousands of students across New England with his powerful stories. He was at the heart and soul of our work at TMF, inspiring and guiding us since our inception twenty-six years ago. In 1941, Edgar was selected to be on the first transport to Terezín, to help convert the garrison town to a concentration camp. He was ordered to set up the kitchen that would feed tens of thousands of prisoners, and he worked there until 1944, when he was deported to Auschwitz. He survived a death march by feigning death after being shot. Following a period in Israel, Edgar came to the U.S. and ran the Veronique restaurant in Brookline, Massachusetts. 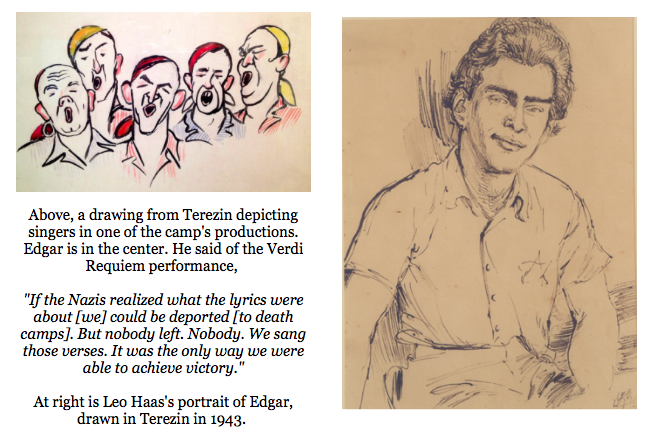 In Terezín, Edgar's barracks-mate was Rafael Schaechter, a pianist and conductor who led more than 150 Terezín prisoners, including Edgar, in performances of Verdi's Requiem, secretly structured as a protest against the Nazis. In memory of Mr. Schaechter, who perished in Auschwitz, Edgar created TMF's Krasa-Schaechter Fund, to sponsor young Czech, Israeli, and American composers. Edgar has been an extraordinary advocate of TMF.